Earlier this year, I shared two interviews – one with Caryn, about the Whimsy & Tea towel she has been using in her kitchen and one with Deirdre, who uses her Whimsy & Tea napkin at breakfast every morning. This month I have a third interview. Carol Chambers and I were in an online writing program led by Debora Seidman. After hearing each other’s voices for four months, it was wonderful to meet in person at Debora’s writing retreat in Taos, NM. In the course of the program, I often wrote about weaving, so I took along some towels to show Carol. Carol retired after working with the federal government and being a self-described “adrenaline junkie.” She now lives in a lovely place full of artists and writers of all kinds in North Carolina. This rich array of creative people feeds and delights her soul and creativity as a writer and painter. What I love about this conversation with Carol is how it kept circling back to connection. Her Whimsy & Tea towel, and the other handmade objects she owns, connect her to friends and memories, to artists, to herself, and to the object itself. What made you decide to buy a handwoven towel? That’s easy. Couple of things. I had seen your towels when we were at Debora’s last year and I thought they were beautiful. You were showing me different patterns that I could choose from or work with you on designing. I loved what you came up with because it was exactly what I wanted. I appreciated you listening to what I was saying with the choice of colors and the stripes. And the most important thing to me is I love anything that is made by somebody’s hands. That’s such a strong connection to someone – to have and use something that somebody has imagined and then brought into reality using their hands. I think that process is just magical: it’s so old and primal. For me, it’s about connection. The connection not only to the person who made the item, but also to people thousands & thousands of years ago who were making pottery, who were weaving, who were making jewelry, whatever their art was. I don’t know when I started feeling so strongly about things made by hand. It goes as far back as I can remember. There’s always been that respect & awe & love for anything that someone made by hand. Do you remember the first thing you bought that was made by hand? I have a feeling it was pottery. The other day I was looking at some pottery I keep on my stove and I remembered exactly where I bought it. I was with a very dear friend of mine who has since died and it brought back all those memories of that day that we shared. Driving out from Washington DC into Maryland, there was a pottery show going on. Being with my friend Noreen was precious because she was sick for many, many years and it was rare that she could go out for a half day much less most of a day. Looking at those two pieces brought that all back to me. What was it like to have a towel made especially for you? It made me feel very special. It made me feel like I had a part in this creative process. I knew you wanted me to be happy and to love this towel, and I did too. It was a partnership with you, the creator. I was looking at it as “This is something I plan to use every day and enjoy for a long, long time.” It created a strong bond with you because I could kind of see through your eyes what pattern you created, what came out of your imagination, the colors – the different gradations, hues, textures and tones. It’s like a part of me going into this too. You were listening to my thoughts, my ideas for what I wanted. I think it’s really special when you have something that is made just for you. It doesn’t happen to me very often that somebody says, “What do you want as far as texture and color and pattern?” Whenever I’ve bought pottery, the pot’s already made. So it was an exciting, new experience. It was very connecting. Again, back to that connection with the artist who made it. I have a bar on the front of my stove and I put it right in the middle of this bar. 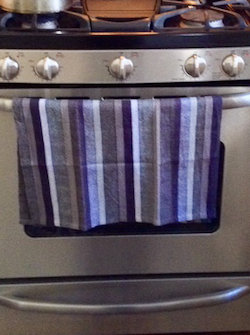 I fix it just so, so I can see the stripes I want to see for that day, so it’s like a piece of art in my kitchen. Every time I look at it, I think “God, that’s beautiful. This was made for me. This was made by somebody who cares for me. Who cares about my tastes. Who wants me to enjoy this.” And I do, every time I use it. It makes me feel good. Every time I see it. If my hands are wet, I use it to dry my hands on. If a handle is hot, I use it to pick up that. The feel of the towel has changed. It’s gotten softer. I love that. I’ve never had that experience with a towel. I think you told me that the feel of it will change over time, and that’s started happening. It’s beyond a tactile experience. It’s a connection every time I touch that. You keep talking about this sense of connection. What difference do you feel that kind of connection makes in your daily life? It’s extremely important. If I don’t have some kind of connection with people or nature or something that I enjoy doing creatively, I feel out of balance. There’s something missing from my day. I don’t feel quite as grounded as I would. Connection keeps me content and grounded and goes into a spiritual connection for me. It permeates every part of my life. It sounds like for you the connection doesn’t have to be a face-to-face or on the phone or even with a person. Touching something that’s handmade can provide you with that connection. Because there are things there that make you feel happy, make you smile or bring back a memory or there’s some history there. There’s connection in that history. I was just thinking about whenever I use the towel you made for me, I’m putting something of myself back into that material and it’s changing the way it feels. It’s like alchemy to me. It’s an amazing process. Could you say a little more about that – your feeling that you are putting something of yourself back into the material. Every time I rub my hands on the towel, it’s changing something about the make up of the texture. The tactile part of that towel. That’s a different experience for me, to have something that responds in a very definite way to touch. Touch is important to me. I’m making a connection with that towel in some way, that’s changing the material and making it softer. I think that’s such a kick and so amazing that something can change as you use it. I love the feel of that towel. It’s my favorite towel. It just feels so soft and yet it’s durable and strong at the same time. There are a lot of descriptive words I think about when I use that towel. You know, like I can lean on this towel. It’s going to last for a while. It isn’t going to fall apart on me. There’s a strength to this towel and there’s also a softness. A yin and yang in the towel. You said that when you asked me to weave this towel for you, you knew all along that you were going to use it. Was it hard for you to use it? A part of me was a little bit concerned about that. When I first saw it, I thought, “Oh my god, this is so beautiful.” I took it out, and thought, “I’ll just put it on the bar on my stove and let it sit there for a day or two.” Then I used it the first day I put it out there. It was a done deal. 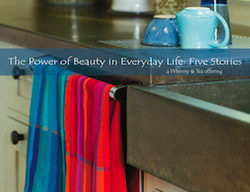 My invitation to you: When you look around your kitchen, what is one thing that connects you with someone else? I’d love to hear the story and significance of that connection.